Volkswagen has released a new commercial, featuring the new all-electric e-Golf, described as the ideal mobility solution for short journeys that lets you also leave the city, as it boasts a range of 300 km. 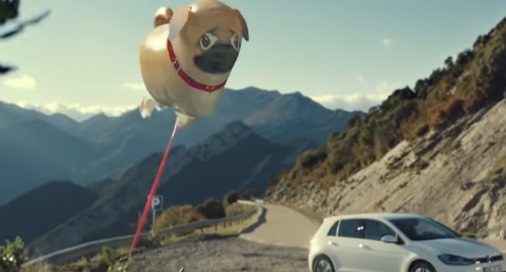 The 30-second spot features a little boy and his dad who embark on a quest to chase and get back the kid’s dog-shaped balloon that he loses after a party. The two travel many miles, through the city and hillsides, encountering a flock of sheep along the way. Riding up a highway across the hills with the e-Golf, the man and his son finally reach the balloon, stuck in a tree. But here comes the twist: after getting it, the boy leaves it fly away again, bringing a smile on his dad’s face, who doesn’t seem very surprised by his son’s decision to set the “doggy” free. The ad ends with the two going back home and with the onscreen line “300 km* of emotions. The all-new electric e-Golf”. emissions in g/km: combined 0; efficiency class: A+, boasts a range of 300 km.